Over the last few months, Crystal Dynamics has been commissioning artworks in celebration of the 15th anniversary of Tomb Raider, with artists from the video game and fine art worlds delivering visions that riff on Lara Croft's new design. These drawings have only been available in an online gallery but fans will now be able to purchase prints and t-shirts via Chuck star Zachary Levi's Nerd Machine. The 15th Anniversary Tomb Raider items will only be available in limited editions with a portion of proceeds going to Penny Arcade's Child's Play charity. 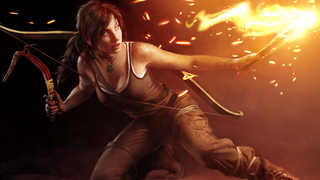 One standout in particular is Lara Croft creator Toby Gard's Asian-inspired return to his iconic heroine. From manga-style exaggeration to super-real rendering, you should be able to find a Lara to suit your taste in these interpretations.